We have recently noticed a large uptick in the use of foil applications on packaging. Foil is certainly not a new technique to packaging and now that it is trending we decided to feature a few of our past projects that demonstrate a few tricks and tips of how you can use foil to increase the perceived value of packaging. ​This first post is obviously a bit biased with the example being our business cards. This example is to show how well gold foil stamping and spot UV compliment each other. 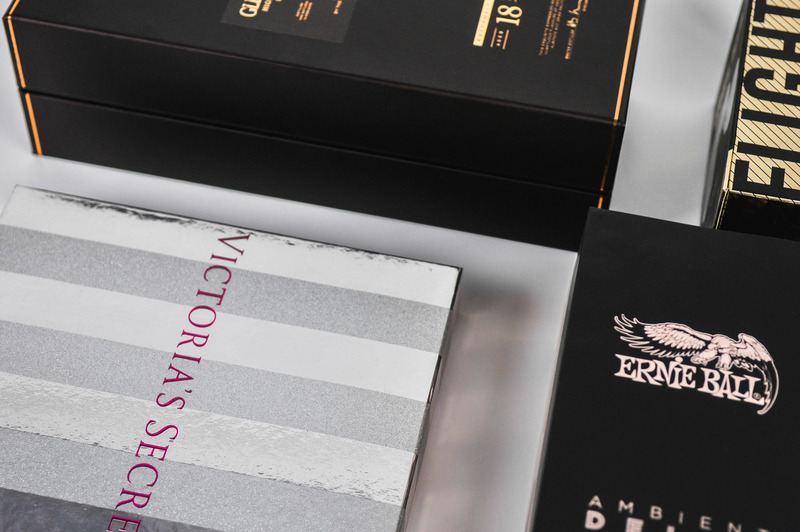 Additionally, we applied foil to the card edges for an extra layer of customization..
​ELWN has the right idea for creating eye-catching packaging at retail. While most companies run to copy the simplicity of Apple or Samsung packaging, ELWN uses bold foil imprints on their packaging to deliver messaging and grab attention when hanging on retail pegs in big box retail stores. This packaging for Ernie Ball isn't as straight forward as a simple foil stamp on soft touch paper. There is actually quite a process behind what it takes to create this finished look on their newest packaging re-design. The whole process actually starts with a silver foil piece of paper and then the rose gold and classic gold color is printed on top as well as the other ink colors shown on the packaging. Once the ink is printed the entire surface is covered with a soft touch lamination and finally, we applied a spot uv to the foil areas to make them pop. Foil can also be used to increase the rustic or heritage feeling of packaging as shown in the below examples. The classic gold and copper colors each lend themselves to creating an antique look for these boxes. We especially love the use of foil stamping on the Links & Kings belt box, the color and location lend itself well to creating a very high perceived value.